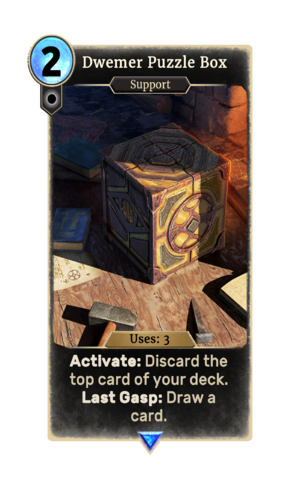 Dwemer Puzzle Box is a rare Neutral support card. It is part of the Houses of Morrowind expansion. It is the only support card with a last gasp effect. The Dwemer Puzzle Box appeared in Morrowind during the quest Antabolis Informant. This page was last modified on 24 September 2018, at 22:41.